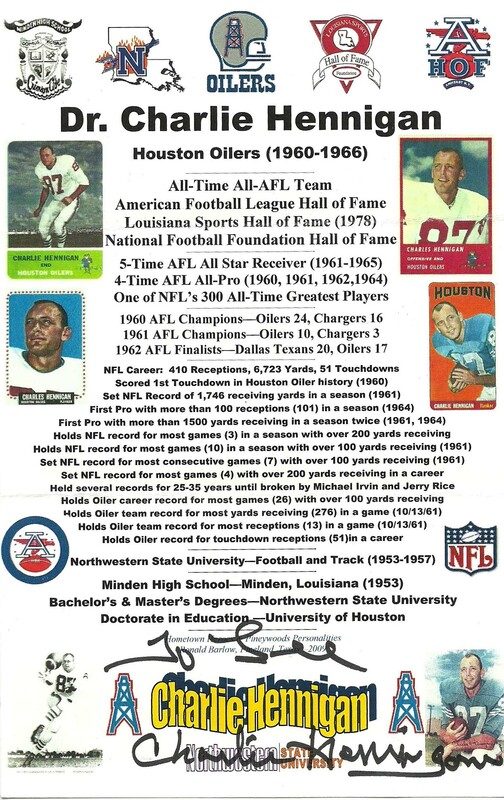 Charlie was an amazingly fast receiver who made the Houston Oiler air attack work during the early years of the AFL where the team won the first two championships of the AFL. A player who has never gotten the respect he has deserved, Hennigan scored the first touchdown in Oiler History back in 1960 and was the main target of George Blanda‘s passes becoming the first player to go over 100 catches in a season with 101 in 1964. 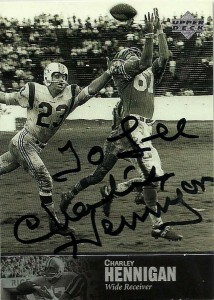 Hennigan would set the AFL/NFL mark for most receiving yards in a season with 1746, which would stand for 34 years. An AFL All Star for 5 of the 6 seasons he played, Hennigan kept a pay stub from his teaching career in his helmet to keep himself grounded. Hennigan still holds the record for most 200 yard receiving games in a season with 3 and most games in a season with over 100 yards at 11. 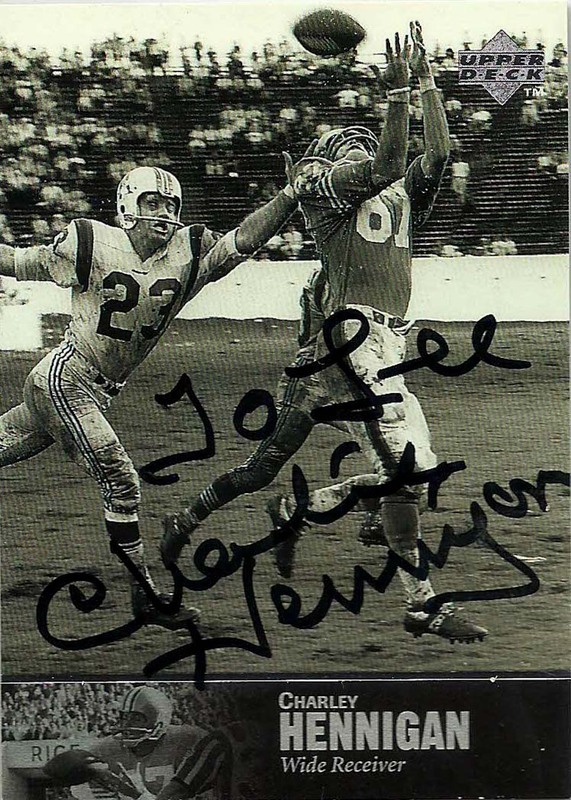 Hennigan would also hold the All AFL record of 272 yards receiving (1962) and would go over 1500 yards receiving in two separate seasons averaging an incredible 124 yards a game in 1961 and 110 in 1964. Incredible numbers considering that players in the 60s played only 14 game seasons. Oddly Hennigan has never been inducted into the NFL Hall of Fame. Many, (myself included) believe that this is an act of hazing from the old guard of the NFL, in barring him and other pioneers of the old AFL from obtaining entry. (I am of the camp that believes the whole AFL should be inducted all at once as league pioneers, and like other professional leagues before them a separate wing be dedicated to their accomplishments.) Hall of Fame defensive back Willie Brown was ironically cut by the Houston Oilers because he could not cover Charlie Hennigan. 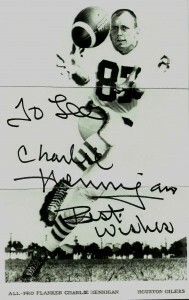 Charlie and Willie would meet again on the field, where Charlie needed only 9 catches to break the AFL record for catches in a season. Charlie got those 9. Hennigan would retire in 1967, founding the Hennigan Institute after getting his Doctorate from the University of Houston. Later on he would go on to teach former prisoners and help them get their GEDs near Shreveport, LA and ran for political office in 2002 as a Democrat. Hennigan also has seven children. * UPDATE * On December 20th, 2017 Dr. Hennigan passed away at the age of 82. Cards: Pro Set 1990 CPotY, Pro Set 1989. 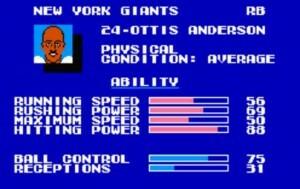 Ottis ‘OJ’ Anderson was drafted in the 1st round by the then St. Louis Cardinals in 1979, rushing for 1,605 yards and garnering Offensive Rookie of the Year honors. Anderson ran for over 1,000 yards in the next 5 seasons, but because of his punishing style, he began to show wear and tear through injuries. 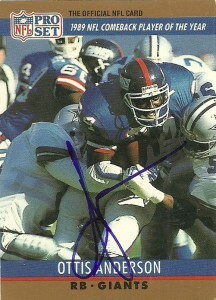 OJ signed with the Giants in 1986, where he found himself knee deep in the depth chart. Bill Parcells utilized OJ in short yardage and in goalline situations as injuries continued to limit his effectiveness. In 1989, OJ found himself atop the depth chart of the Giants in Bill Parcells ball control offense. OJ had brick hands for catching the ball yet, was a sure handed runner who rarely fumbled (3 times while playing for the Giants from 1986-1992.). Later in that year, he ran for 1023 yards, won Comeback Player of the Year honors and was Superbowl XXV MVP with 21 carries and 102 yards. 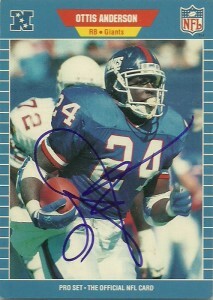 Anderson retired in 1992 after 13 years and is one of a select few of runningbacks who has run for over 10,000 yards. After football OJ has become a motivational speaker, done commentary for NFL games, and is involved with a variety of charities and causes. 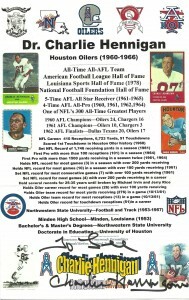 OJ Anderson surprisingly is not in the Pro Football Hall of Fame despite his extensive credentials and MVP honors. OJ Anderson was in the second blitz of players I mailed out to in 2010. I located his website and fee regarding autographs and sent out these two cards. My general rule of thumb with most players is to send out two cards, that way I can compare the autographs that come back to check the authenticity of them. I was surprised that I got back this one and that these are both considered authentic, – as they both looked like scribble. The ball control offense that the Giants ran during this time period was- annoying and boring, but watching OJ pound the rock that year was a thing of beauty. Cards: Pro Set 1989, Pro Set 1990, Fleer 1990, Score 1989. 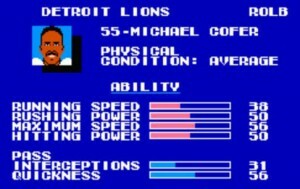 I used to play Tecmo Super Bowl non stop with my friends back in the early 1990s, and the Lions back then were still playoff competitors with Barry Sanders and the Run N Shoot offense. 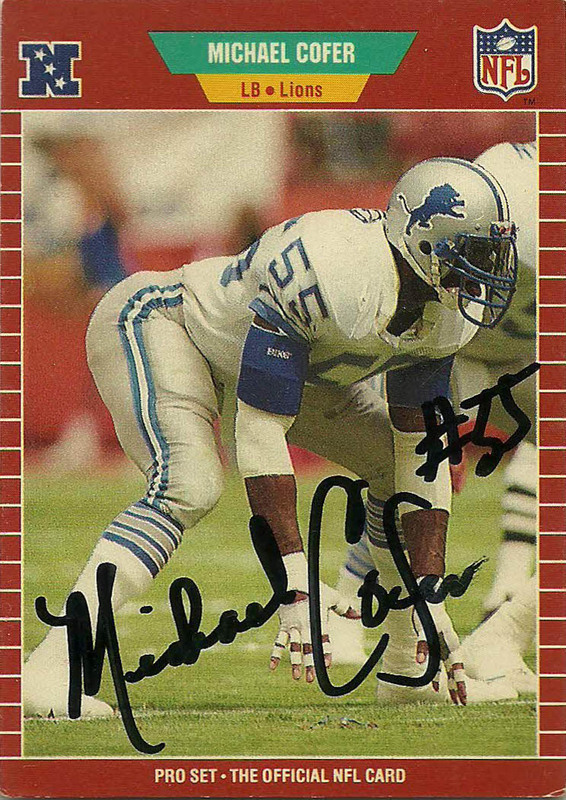 On defense the Lions had some great contributors and among them was Michael Cofer, a speedy blitzing linebacker. 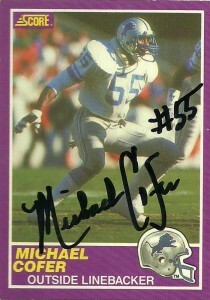 While Spielman would grab all the tackles, and Crockett would get the picks, Cofer would get the sacks. When I’d play against friends and I suspected that they were bootlegging I’d select Cofer every time and blitz from the outside before they even finished rolling out. 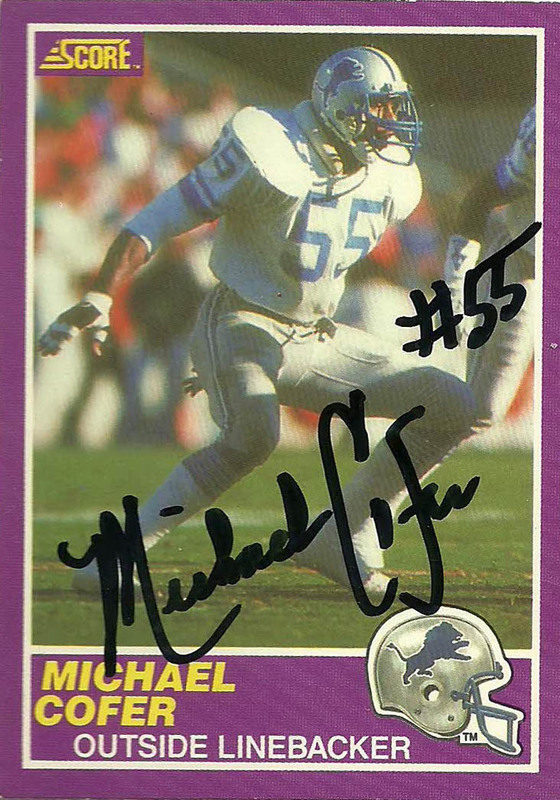 Michael Lynn Cofer was drafted in the 3rd round by the Detroit Lions in the infamous 1983 draft (and was technically the 9th linebacker taken. Cofer was also taken by the New Jersey Generals in the USFL territorial draft but opted to sign with Detroit.) 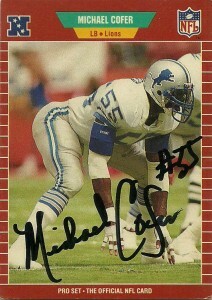 Playing defensive end his first two seasons, Cofer was then converted to the linebacker position in 1986 where he remained the rest of his career. 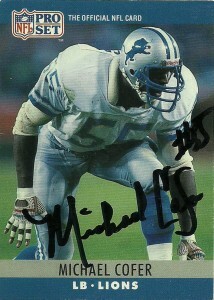 Finding his home, he’d go on to notch at least 7 sacks in each of the next 5 seasons with 12 in 1988 and 10 in 1990. Roaming the fields in his black visor shield, (one of the first in the league,) Cofer was unblockable when his game was on and was compared to such greats as Lawrence Taylor and Reggie White by opposing players. 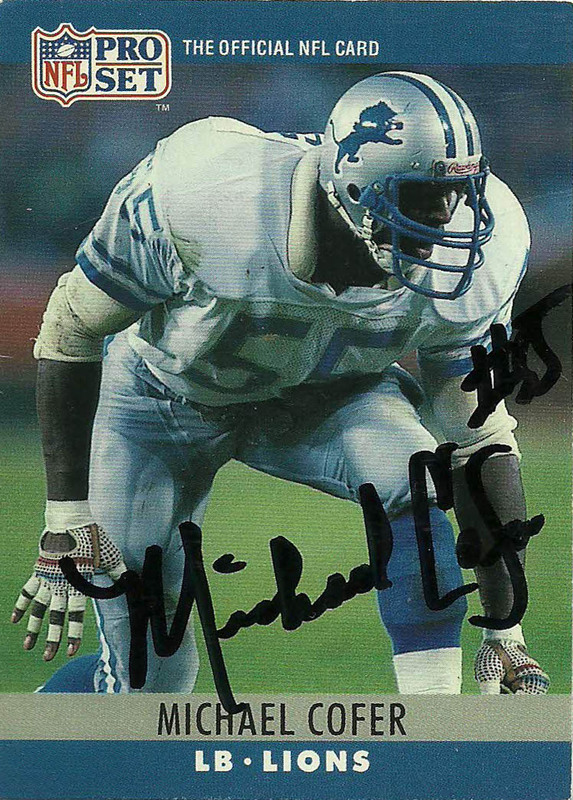 He’d be named to the Pro Bowl in 1988, was named second team All NFL both of those seasons and led the team in sacks in four of those seasons. 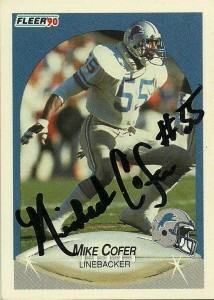 Cofer would be bitten by the injury bug on occasion which impacted his statistics if looked at over a 10 season career, playing in 123 games. In 1991 he suffered a knee injury in a victory at the Silverdome over the visiting Dolphins, that ended his season, and his career was never the same, retiring soon there after in 1992. Mike, a former Vol, has been battling with Amyloidosis and appreciates the letters of encouragement he receives from fans. If you are a fan who has benefited from his generosity in person or through the mail or considering writing him through the mail, please donate to his gofundme effort. 5, 10, 20 – It all helps and Mike needs our help now. 3/21/19 UPDATE: Mike Cofer passed away today after a lengthy battle with Amyloidosis. Over the last two years I tried to do what I could and gave his GoFundMe about 50 bucks. It was the least I could do. From all accounts that I had read, he was a good man. Mike was just 58.